For most folks who enjoy photographing wildlife in general, and birds-in-flight in particular, having additional ‘reach’ with their gear is always preferred. I was out yesterday morning attempting to capture some Purple Martin in flight and came to the realization that sometimes shorter is better. I’ve visited the Purple Martin colony at Ruthven Park in Cayuga Ontario a number of times in the past with very little luck getting any usable images. Like many photographers I was typically too aggressive in terms of the focal length I was trying to use. It is a good strategy to try to ‘fill the frame’ with a subject bird, but that’s of little use if one can’t keep the bird in the frame long enough to acquire focus on it. 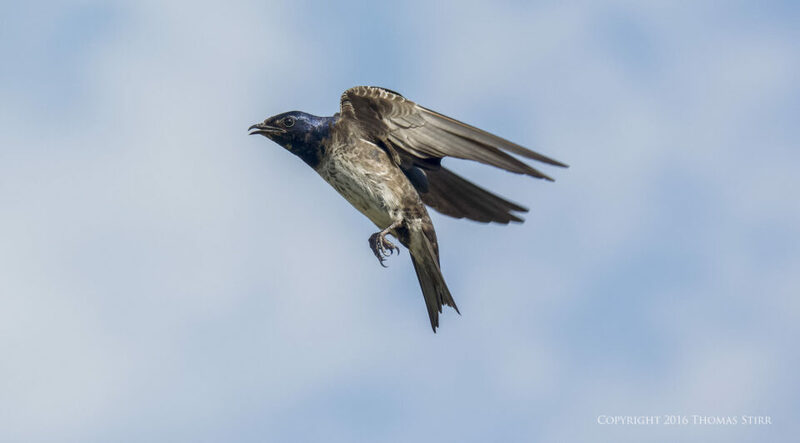 Suffice to say that my previous attempts to photograph Purple Martin in flight ended up producing next to nothing to show for my efforts. 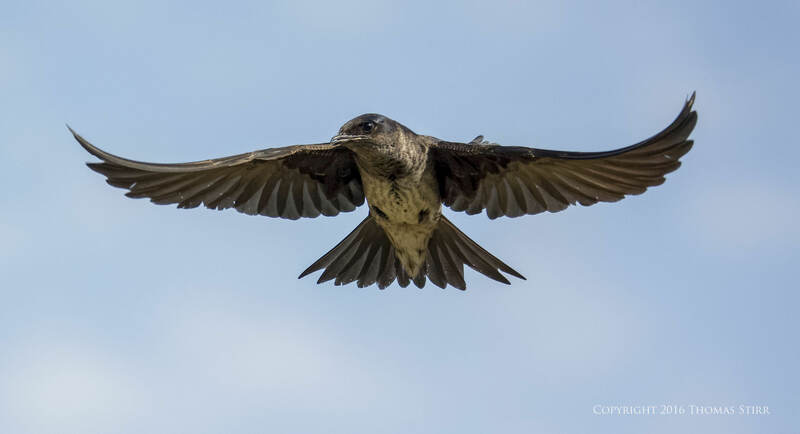 Like all swallows, Purple Martin are very fast and aerobatic flyers making it challenging to capture them in flight. While their flight patterns look quite erratic I decided to spend some time observing individual birds to see if there was any kind of consistency to their movements. I discovered that there were a few somewhat common approaches that the birds would use when returning to their nesting boxes. So, I moved to a different position than I had used in the past. The temptation was too great and I initially tried shooting with my CX 70-300 fully extended. After spending 15 minutes pointlessly trying to capture some BIF images at that focal length the light in my old brain finally went off, and I backed my zoom off and began shooting in the 140mm-220mm focal length range instead. Obviously I couldn’t get the birds as large as I wanted in the frame, but at least I could track with them in the frame long enough to acquire focus on them. The resulting images required some fairly aggressive cropping. For example, most photographs in this article represent approximately 45% to 65% of sensor surface area, with image subjects being smaller than that. On the positive side, at least I finally captured a few images of these little feathered rocket ships. After spending a couple of hours I came away with a couple of dozen decent images. Certainly not award winners…but great fun nonetheless. The most important take-away from the morning for me was the reminder to use a focal length that was appropriate for the speed and size of the subjects being photographed, as well as for my skill level. Article and all images are Copyright 2016 Thomas Stirr. All rights reserved. No use, adaptation or reproduction of any kind is allowed without written consent. Photography Life is the only approved user of this article. If you see it reproduced anywhere else it is an unauthorized and illegal use. That was really very constructive! I couldn’t agree more. Your most important point is that the “smaller” the image is , the easier it is to track, so providing you have plenty of megapixels your result will always be better. I had great results in the Antarctic, with a 70-200 f2.8 on a Canon 7D, even with those impossible little Prions. Being able to put more megapixels on a subject can certainly help with an image. My Nikon 1 V2 only has a 14.2MP sensor so the cropped images in this article would not be able to be printed at a large size. I agree that creating images should be a fun experience! “Nonetheless” is an actual word. Thanks XM…I made the change. I really enjoyed viewing your photos. That makes sense, great pictures. But as Richard mentioned, you do need a camera with plenty megapixels. Glad you enjoyed them Wim! As far as the number of megapixels it really depends on the end-use of an image. My Nikon 1 V2 only has a 14.2MP sensor but for the purposes of 2048 pixel width images (the size of images in this article) that was sufficient. Not only that it’s easier the more space you have left and right of your subject, but that usually with more reach comes more bulk and weight to your gear which makes it even more difficult. After having experienced every stage in bulk from a Nikon D90 with 70-300 5.6 (1100g) to a D4s with Sigma 150-600 Sport (4400g) or Nikon 200-400 VR2 I sometimes now wish it wasn’t so hard to track birds with them. 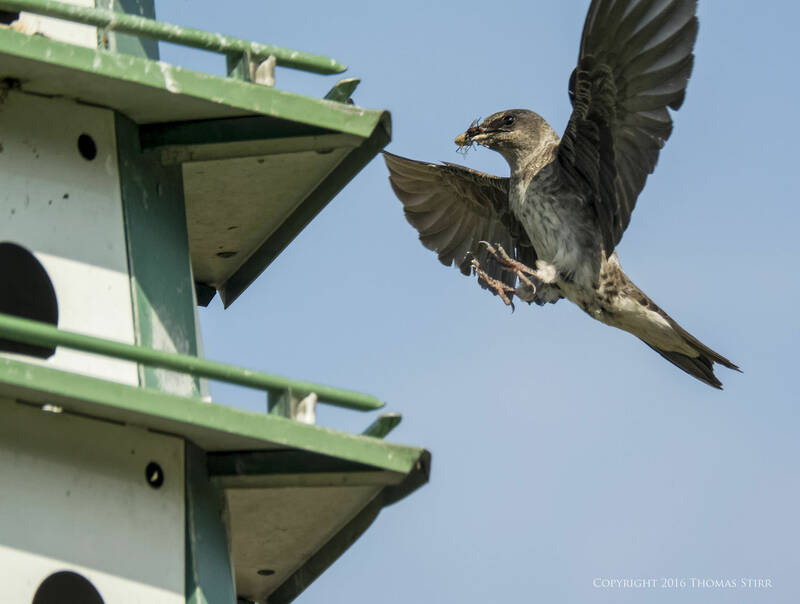 Thanks for the short but surely very needed article for birders that are getting started. Thanks for adding to the discussion Andrej! The small size and light weight of my Nikon 1 gear is something that I love. My Nikon 1 V2 with the CX 70-300mm f/4.5-5.6 only weighs 778 grams (plus battery) and with the 2.7X crop factor has an equivalent field-of-view of 189mm to 810mm when compared to a full frame camera. There are some drawbacks of course in terms of sensor performance but my set-up is very easy to use in terms of tracking birds-in-flight…assuming I use the appropriate focal length of course! I learned that lesson in Africa shooting carmine breasted bee eaters. They follow slowly moving vehicles to catch the insects disturbed from the grass. If you want erratic, these guys are masters at it. Shooting was only possible by keeping the vehicle moving and shooting with a short lens at high shutter speed. It was great fun but also infinitely frustrating trying to catch a bird in focus while trying to counteract the bumping and jogging at the same time! Thanks for sharing your experience photographing carmine breasted bee eaters Betty! Another useful helper is the (Olympus) Red Dot Sight which fits any standard hotshoe and makes keeping the bird in your image sensor autofocus area much easier. Thanks for your comment and the suggestion for the Red Dot Sight! 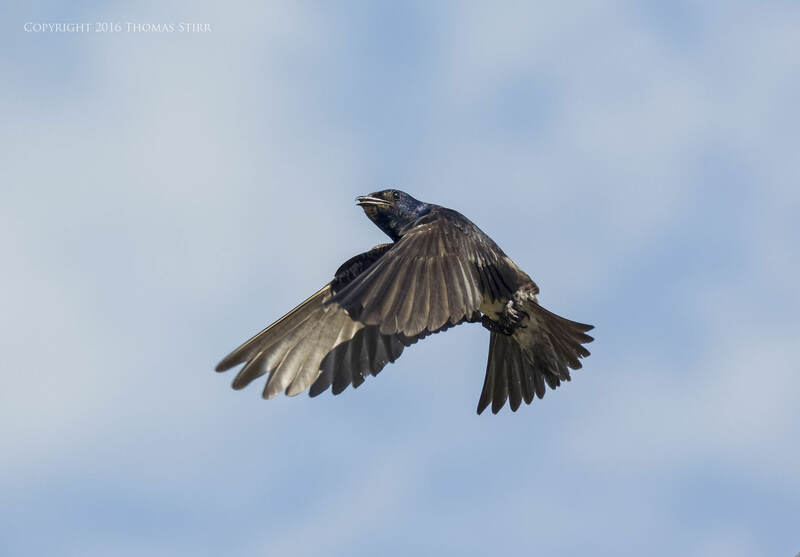 Purple martins, swifts and goldfinches are more difficult to follow in flight than a fighter jet! I’ve seen two male goldfinches in a dogfight with each other. They corner like they’re on rails. 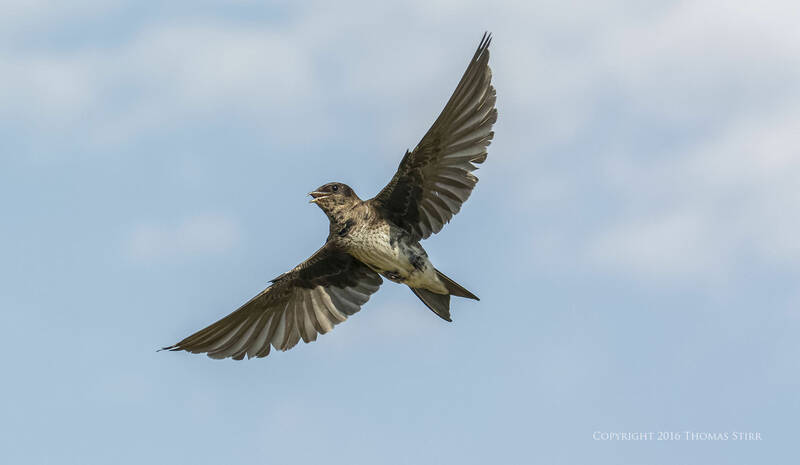 Swifts, when they’re chasing bugs in a wetland area, tend to swoop through the air and following them is difficult at best. They are divebombers personified, but it’s always worth it to give it a try. And try shooting killdeers. They show no mercy to the poor photographer, but they do give you that ‘gotcha’ look just for trying. I think it’s the reason most people are attracted to the bigger birds like herons in flight or hawks, turkey buzzards and cranes. They move much more slowly. 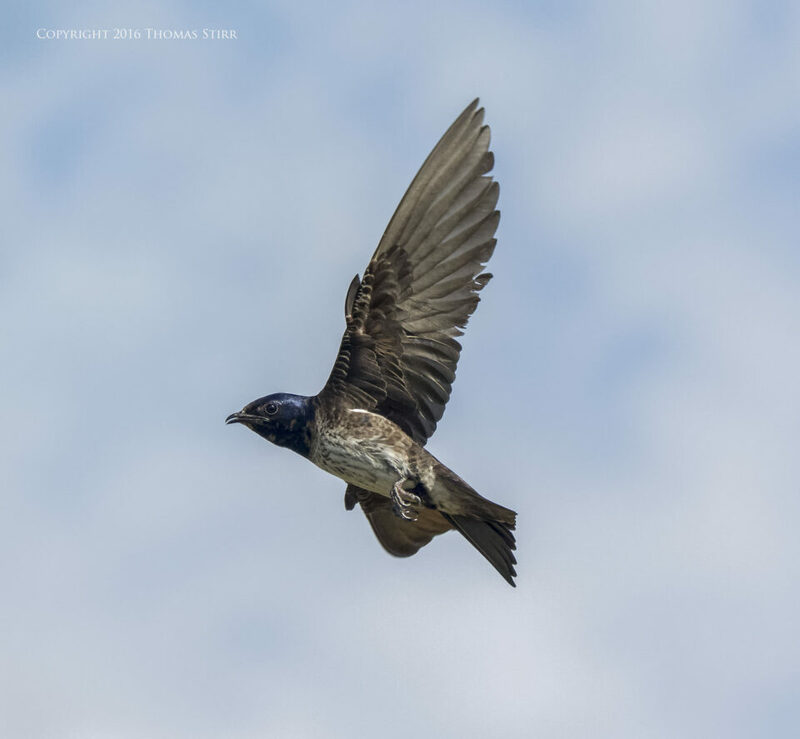 Thanks for sharing your experiences and perspectives about photographing birds-in-flight! This article is spot on. I remember on a forum some guy was slagging the tamron 150-600 because it wasn’t capable of taking sharp pictures of birds in flight. I presented him shots of a great blue heron and bald eagle that were very sharp. He response was they are big birds and easy to track. Yeah he is right. It is close to impossible to get focus on a swallow at 600mm with it filling an acceptable amount of the frame. He is wrong about the tamron not being able to take a sharp picture of bird in flight though. That is all about shutter speed. When I was shooting with a Nikon D800 and FX lenses I owned a Tamron 150-600mm and I quite enjoyed shooting with it. If you check out my review of that lens you’ll see a good selection of images taken with it. I thought the lens was pretty sharp, but stopping it down to f/8 at the long end did help. I also thought the VR on the Tamron 150-600 was quite good.